This California site has been open with the Central Coast Regional Board for over 20 years with groundwater VOC concentrations thousands of times higher than the MCL. The site also had limited metal concentrations above MCL. 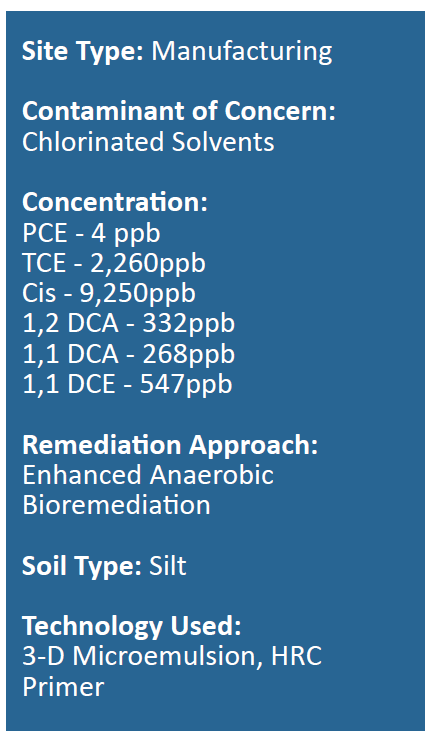 A remediation plan was created to treat the groundwater plume using enhanced anaerobic bioremediation via Hydrogen Release Compound (HRC®) Primer and 3-D Microemulsion®. Immediate results showed a decrease in TCE concentrations from 2,260 ppb to 12 ppb. Seven separate designs were developed to treat the 60,450-square-foot area. Several water bearing zones were treated throughout the site. Initial concerns for treatment included the possibility of a buildup of methane in the soil gas. However, because 3-D Microemulsion is a controlled-release, high-volume electron donor, no methane issues were observed. Cost for the product and application was less than $10 per cubic yard and the site is currently under review for closure. 3-D Microemulsion is an engineered electron donor material that offers a novel 3-stage electron donor release profile, pH neutral chemistry and is delivered on-site as a factory-emulsified product. HRC Primer is a less viscous version of the standard Hydrogen Release Compound (HRC) product. It is a thinner, water-like compound that is typically injected into an aquifer where it releases lactic acid at a rate faster than standard HRC (several weeks), but at a slower, more controlled rate than dispersing aqueous simple sugar solutions or straight lactic acid (several days).